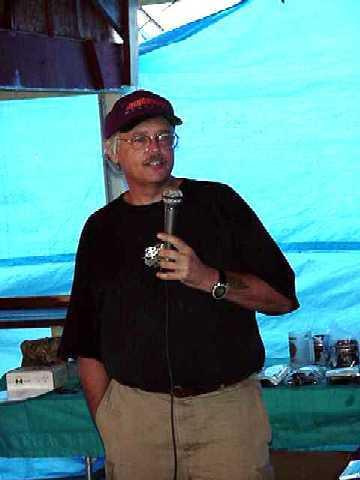 Front Range IDPA was founded by Michael Bane, a friend of Bill Wilson and an IPSC shooter from "way back". Michael is a writer, speaker, etc. and has authored the biographies of many country and western stars and one of Bill Wilson's .45 Auto books. With myself following close on Michael's heels in Front Range IDPA (actually, as Front Range got it's start! ), I can't remember if we went to the invitational before or after holding our first match at Golden Gun Club, but I do remember the first match was an extravagant affair (OK, not really), and nobody showed up! Really!! I think it was May (1997?) and we had a snowstorm that was just bitter cold. Michael's significant other and her brother were the only other people there besides Michael and I. We shot maybe ten shots between taking our hands out of our pockets just long enough to get frost bite. The next match (our "real" first match) was quite a bit more successful! We actually had shooters (maybe five or six?) and ran an honest to goodness match. I don't remember if Michael attended or not, but I can't recall him being there for that one and his rareness at subsequent matches gained him the legendary status as an imaginary person that I made up to take the blame for screw ups. Coincidentally, he still serves in this capacity and does a fine job of it, if I might add! Michael did come to the matches when he was in the area and I still remember one of the matches that he brought stop watches to use as timers for the shooters. We yelled "stop" or "stick 'em up" or some other silly thing I can't (or don't want to) remember clearly as the start signal. There were some safety "problem child's" back then, so the stop watch sometimes didn't get "stopped" immediately after the shooter was finished (due to hitting the deck while avoiding the muzzle of a loaded gun!) It was my decision early on (after my third face plant at this match) that we would do whatever it took to acquire some timers that would eliminate the ambiguity of officiating the shooters time, while allowing us range officers (the term "Safety Officer" had yet to be coined) to comfortably and quickly "eat dirt" whenever a muzzle found its way to our side (often enough that we considered buying a riot shield and a catchers face mask to curb the clubs mounting dental bills related to the RO face plants - just kidding.) So we shot the original matches at Golden Gun Club, having to stop the Rifle firing line in order to go downrange to score targets, getting comments from the rifle shooters to the effect that "well we're shooting down that way, not towards you guys, why do we have to stop?" (the rifle and pistol lines at GGC are facing the same direction down range with no separation berms.) Since we really only had one range to set up courses on and the fact that the GGC would not address some safety issues we had, was half way to bloody Kansas, and was just not conducive to pistol matches, we decided that greener pastures should be sought with all diligence. We looked at a few opportunities, but nothing really raised it's head as an "ideal" range. Then, with Michael being a "fixer" more than a runner of things, and with the help of one of our earliest shooters, he found Northern Colorado Rod and Gun Club North of Ft. Collins (still a hekuva long ways away) whom were very receptive to having us there - unlike most of the other organized ranges we approached - and they gave us a day to have the range all to ourselves to run matches, the fourth Saturday of the month. The range at Owl Canyon is still not set up with separate berms or shooting bays, but it's a far cry from what we had and the range has been very supportive and pretty much "hands off, let them do their own thing". Because of the way the ranges are built that we've been running our matches at, our stages have been "unusual" to say the least. We do not and will not usurp IDPA ideals and principles regarding rules or courses of fire though. IDPA principles want us to run matches as quick, short courses. Well, people will not drive 2 hours or more (that's the drive for some from the Denver metro area - where most of our shooters live) to shoot half a box of shells and go home. We've pushed many of our stages to the round-count limit of 18 and acquired (and have plans to buy more when the $ are available) a few steels that help with upping the round count so that most are satisfied with the amount of rounds they get to put down range before having to trek home. Some want the short, quick stages, but due to how the range is laid out (only one large range) we can only run two stages at a time safely, and then break down and set up two more. There have been some excellent suggestions on how to correct this dilemma, and one of our members had an article in the IDPA Tactical Journal addressing this problem. We have always been a "fluid" club, allowing changes and trying new ways of doing things, remaining within IDPA guidelines for our courses, and we will likely try these new ideas in our evolution to satisfy all types of shooters who enjoy these matches. In August of 1999, the BOD voted in a new member, Dave P., to serve as the Rifle/Shotgun Program Director. The Entire Board of Directors of Front Range IDPA has been trained/certified in Defensive Rifle and Shotgun tactics courses so that we would have a better understanding of how those skills are used in defensive situtations and help us to design "realistic" courses. Over the course of many months, we developed a rifle and shotgun rule book for these defensive side matches ) and regularly hold defensive rifle and shotgun side match after the regular IDPA matches. When held, these side matches will always be AFTER the regular IDPA matches and are short, defensive scenarios that will likely use the stages that were used in the regular IDPA match. November of 1999 was our first match at the Clear Creek County Sportsmen Club (formerly the Clear Creek County Sportsmans Club) range in Dumont. 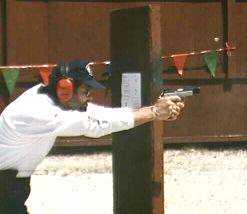 We have been holding two matches per month since then, one on the 2nd Saturday of the month at Clear Creek and one at the Owl Canyon range on the 4th Saturday of the month. We have only cancelled one of the Clear Creek matches due to weather, but we still froze our butts off at a few of the other matches and most of us are Definitely looking forward to summer! Front Range IDPA continues to seek out new ranges to add more matches per month along the entire Front Range of Colorado. Look forward this spring to matches starting in the Colorado Springs area!